Regardless of having a legion of experienced administrators at your disposal to safeguard the compliancy of your company with Philippine regulations, if there is a slight nick in your payroll resources and practices, what you long strived to protect—reputation and company records–will crumble. For that reason, many employers are crossing their fingers that their payroll was processed flawlessly. Most importantly, free of compliance issues that could be brought about by the recent changes in the withholding tax calculations due to the TRAIN 2018-2022 Tax Reforms. When it comes to manually computing payroll, the formula being used is only as good as the numbers inputted. Though the payroll process remains the same under the reforms brought by the 2018 TRAIN, what changes are the figures on the withholding tax table and how to use it. 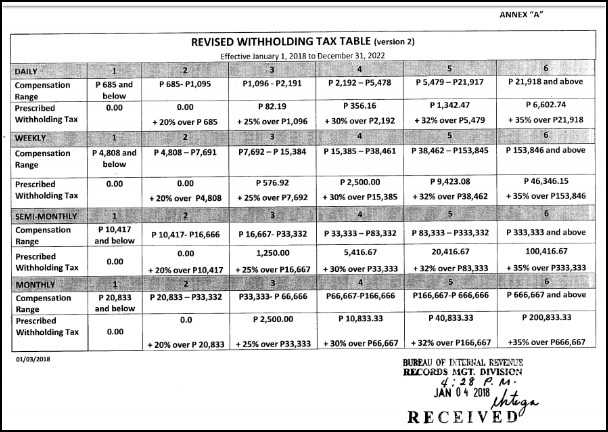 As prescribed by the Bureau of Internal Revenue (BIR), payroll administrators should use the Revised Withholding Tax Table (Version 2). Step 2: Using the Revised Tax Table, choose which column (1 – 6) where compensation range of the employee falls under. Step 3: Use the prescribed withholding tax that applies to the pay frequency and compensation range option. Step 4: Use the (A) predetermined tax and then add that to (B) percentage of the amount that is excess to the total compensation over the (C) minimum compensation range. Calculating for the withholding tax this way may be tedious, but in time, it could become second nature to the one handling the payroll calculations. However, it is important to note that there is still the possibility of getting human errors. In contrast to manual payroll process, ensuring that your on-premise or desktop application is compliant is an easier adjustment. 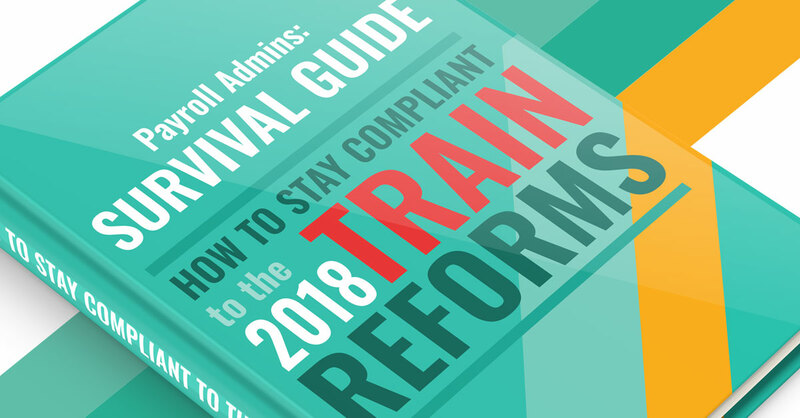 It is a matter of ensuring that your software received the latest patch and if the update includes the changes brought by the 2018 TRAIN tax reforms. For most cases, you would have to contact your supplier and directly ask them about the updates. Some suppliers would require for you to make a payment first for the patch or update before it gets implemented and be ready to be used. Much like the on-premise application, using a cloud-based payroll software is a matter getting the update. However, what sets this type of payroll processing tool apart from the on-premise payroll application is that the updates are usually already included with the service. Reliable cloud-based applications like PhilPay, a payroll software distributed by JustPayroll, provide patches or updates for free without necessarily having to download heavy files. Announcements about changes and updates are sent out to clients, in which eliminates the need to be contacted. To be safe, if you are using a different payroll software, it is best to contact your supplier to be sure that you are using the most compliant version. Are they certified payroll professional or CIPPs? CIPPs are generally knowledgeable and capable of adapting to changes in the taxes. They stand by their work because their credibility depends on it. Are they aware of the 2018 TRAIN Tax Reform changes? If your payroll service provider didn’t even hear about the recent tax reforms on the withholding tax, it is definitely a red flag. Are the tools and resources they are using updated? In case that your payroll processing providers are performing their tasks manually, ask which version of the withholding tax table they are using. For those using payroll software, ask if they are up to date. Compliancy is a must for every company or business in the Philippines. Besides from the fines that one receives for every payroll error, it has a detrimental effect that trickles all the way down to the company’s reputation, legal records, and employee attitude. Keeping up with the changes in payroll, monitoring time and attendance, and calculating salaries can get complicated, but it doesn’t have to be… Afterall, it’s JustPayroll.ph. We offer enterprise-grade payroll software, premium biometric devices, and superior outsourced payroll services.